Come Celebrate the Life of Dr. Martin L. King Jr.
in the History of Non-Violence! Enjoy an afternoon of Calvin Woodland impersonating the voice of Dr. King and sharing his famous quotations; hear keynote speaker, Dr. Ben Chavis (see bio below information), who worked with MLK during the civil rights movement, share his reflections of the challenges they faced and their triumphs; listen to interfaith expressions relating the tenets of different religions to the important teachings of MLK; savor the inspiring music by well known gospel singer Wyomme Pariss and the beautiful musical selections by the World Children’s Choir, as well as a special treat with the famous Hip Hop Artist, Husha Assad, offering powerful pieces about our society and Dr. King’s vision. Finally, a unique, “Speak Your Mind” during a brief mini-Community Dialogue about issues you are concerned about in our society today! This is an event the whole family will enjoy. Space is limited so sign up right away to secure a table. 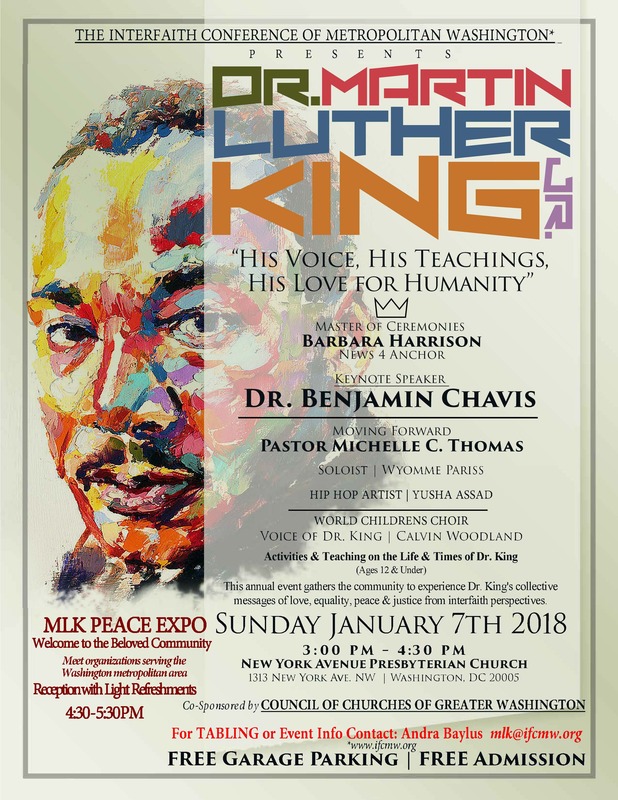 1399 New York Avenue Washington, DC 20005 until 6:15 p.m.
Rev.Dr.Benjamin Chavis, our keynote speaker, was an African American Civil Rights Leader who was an assistant to Martin L. King Jr. who inspired him to work in the civil rights movement. Throughout his career, Dr. Chavis has held many key positions. In addition to being on the “advance team” for Dr.King, he served as a youth coordinator for the Southern Christian Leadership Conference (SCLC). He was appointed Southern Regional Program Director of the United Church of Christ Commission for Racial Justice (UCC-CRJ and later became the Executive Director of UCC and CEO of the UCC-CRJ. Additionally, he served as Vice President of the National Council of Churches and was the youngest Executive Director and CEO of the NAACP, the nation’s oldest, largest and most widely recognized civil rights organization in the US. Dr. Chavis, is well-known for being appointed National Director of the Million Man March, one of the most successful gatherings of the 20th century. Dr.Chavis is a noted author, and sought- after speaker who eloquently sheds light upon the history of the civil rights movement and the legacy of Dr. King’s wisdom in today’s world.